Key difference: The North and South poles are Earth’s ending poles. The North Pole is the northernmost point of the Earth's axis; commonly known as the Arctic region. While, the South Pole is the southernmost point of the Earth's axis; commonly known as the Antarctic continent. The Earth’s North and South poles are known as the end poles lying to the extreme points of the earth. The north and south poles comprises of the Earth’s Polar Regions. The North Pole is the Arctic region, which is located in the middle of the Arctic Ocean surrounded by continents. On the other hand, the South Pole comprises of the huge Antarctic continent surrounded by oceans. Both, North and South poles have some factors in similar to each other, while there are many such factors which differentiate them from each other. The North Pole lies to the northernmost point of the Earth’s axis. It’s the region of floating ice sheet with no land mass, known as the Arctic region. It is mainly located in the north polar ocean. This regions includes several larger islands such as Greenland, Spitzbergen, Franz Josef Land, Severnaya Zemlya, Wrangel Island, Bank Island, Victoria Island, Ellesmere Island and various others that all boarder the countries like Russia, Canada, Alaska and Greenland. The Arctic Ocean is surrounded by continents. The seasonal icebergs found here are calved from the glaciers. This region has its own natural Floral and Fauna which adds a terrific beauty in its nature. The humans also reside in the North Pole. The South Pole lies to the southernmost point of the Earth’s axis. It’s basically a huge continent named Antarctica, which is covered with an immense ice shelf. One of the most striking facts about the Antarctic continent is its almost complete glaciations. The frozen region contains the huge ice mountains; along with average temperature of 55°C. The Antarctic continent covers area from South Pole to the southern polar circle. It’s the world’s only completely uninhabited continent. 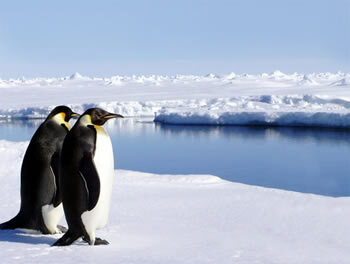 Antarctica consists of immense network of ice fields interconnected to the valleys of high peaks. The Floral and Fauna existence is very less as compared to the North Pole. Both, North and South Poles have distinctive characteristic features. 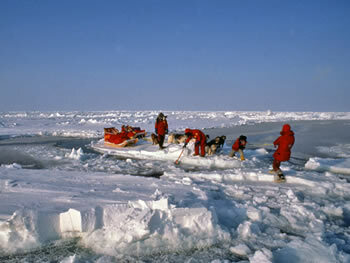 Unlike, the Arctic region, even Antarctic was only discovered in the nineteenth century. Arctic region was found prior to Antarctic; while, today Antarctica is a continent which covers a massive ice sheet 2.8 miles thick in some of its areas. On the other hand, the Arctic is located in a landmass of above 12 frozen feet of ice. The Arctic region is actually very cold, but if compared with Antarctica in south it is much warmer. This is in the middle of the Arctic Ocean surrounded by continents. This is the Antarctic continent surrounded by oceans. This is a region of floating ice sheet and no land mass, commonly known amidst the Arctic Ocean. This is a landmass known as the continent of Antarctic. The annual mean temperature on the North Pole is 0 degrees Fahrenheit. The South Pole is much colder than the North Pole. The annual mean temperature at the South Pole is minus-58 degrees Fahrenheit. There is well developed tundra and a visible tree shrub line here. There is no tundra or tree lines here. There are native people and ethnic groups living on the continents. No human activity exists here. Fishing is close to mainland. The Nutrient richness has led to fishing and whaling. Important Research area and site of military presence.